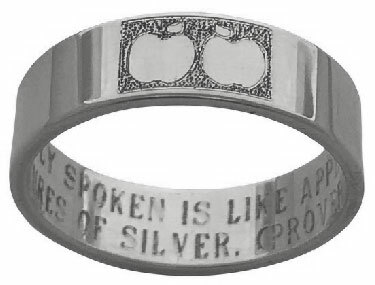 The sterling silver "Apples of Gold" ring is available in both men's and women's ring sizes, is perfect as a stand-alone ring, purity ring or silver wedding band and is inspired by Proverbs 25:11: "A word fitly spoken is like apples of gold in pictures of silver." The .925 sterling silver Bible verse ring features two Apples of Gold emblems side by side and the full verse of Proverbs 25:11 engraved on the inside. Available in your choice of 6mm (shown), 7mm or 8mm widths. You can also choose from 14k yellow gold or white gold (shown below), sterling silver or platinum (by custom request). The Apples of Gold ring is made to order in the U.S.A. Please allow approx. 5-7 business days before shipping. We guarantee our Apples of Gold Ring in Sterling Silver to be high quality, authentic jewelry, as described above.